Crystic Crestabond – Scott Bader has invested significantly in recent years to successfully develop Crestabond; a range of market leading primer-less structural adhesives. They have been designed for bonding a wide range of dissimilar substrates including metals and plastics as well as composite materials for industrial applications. Crystic Crestabond is a patented methylmethacrylate adhesive with excellent adhesive properties being successfully used by many UK and global manufacturing companies operating in the marine, wind energy, building and construction, land transportation and vehicles industries. 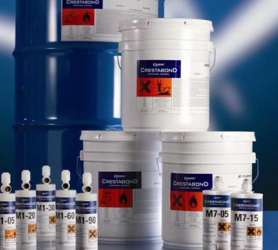 Crystic Crestabond is a toughened, two component 10:1 MMA and 1:1 MMA structural adhesive which is designed for bonding a wide range of substrates including metals, plastics and composite materials in industrial applications. This adhesive demonstrates excellent impact, peel, shear, compressive strength and fatigue resistance properties across all bonded parts especially with galvanised metals. Crestabond is a primer-less MMA adhesive, requiring minimal surface preparation helping to reduce overall production costs and increase productivity. The Crestabond cartridges can be applied using a manual or pneumatic gun. Suitable manual and pneumatic guns plus static mixers, are available to purchase from Chemical Specialties Ltd. Paint blistering over Turbo Builder’s Bog?